Posts on cooking, eating, and food. 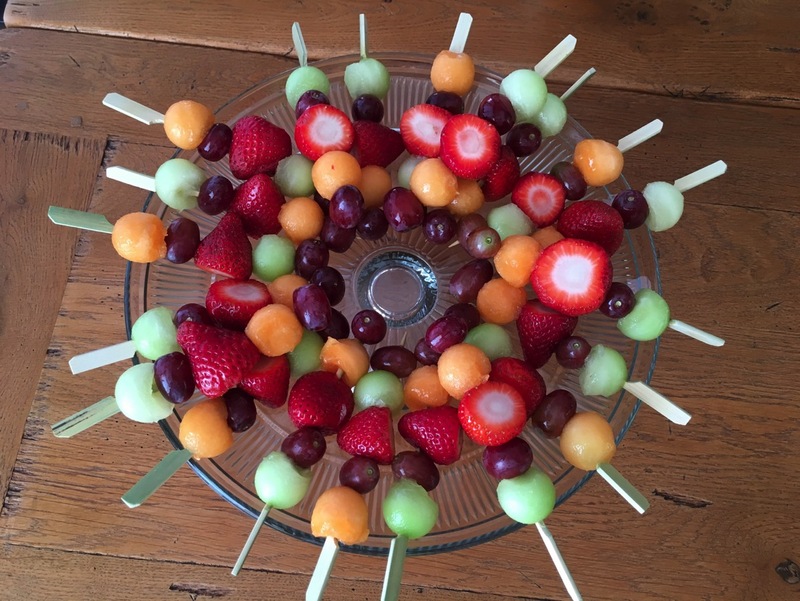 Fruit skewers are an amazingly easy crowd-pleaser. They’re quick to make. They’re colorful, and they’re tasty. They’re an appetizer and/or a dessert. What more could you want for simple party food? Hint: Melon balls don’t always come out perfectly round. Skewer the melon so that the flat side is toward the grape, and it will be less obvious. My mother suggests a light drizzle of honey as a finishing touch. I suspect that’s important if the fruit isn’t at its peak of ripeness / sweetness. I didn’t find it necessary for the platter pictured here. We’re getting fantastic melon and strawberries right now in Northern California, so your milage may vary. This began as a collaboration with Éric Trépanier during his visit to California in the summer of 2015. He’d been watching a French Canadian cooking show, Qu’est-ce qu’on mange pour souper focused on making healthy meals in 30 minutes. This “Lasagne à la Ratatouille” got rave reviews in his household, so we decided to make it together. I’ve made it many times since. The bulk of the time spent making the dish is chopping then sautéeing vegetables. 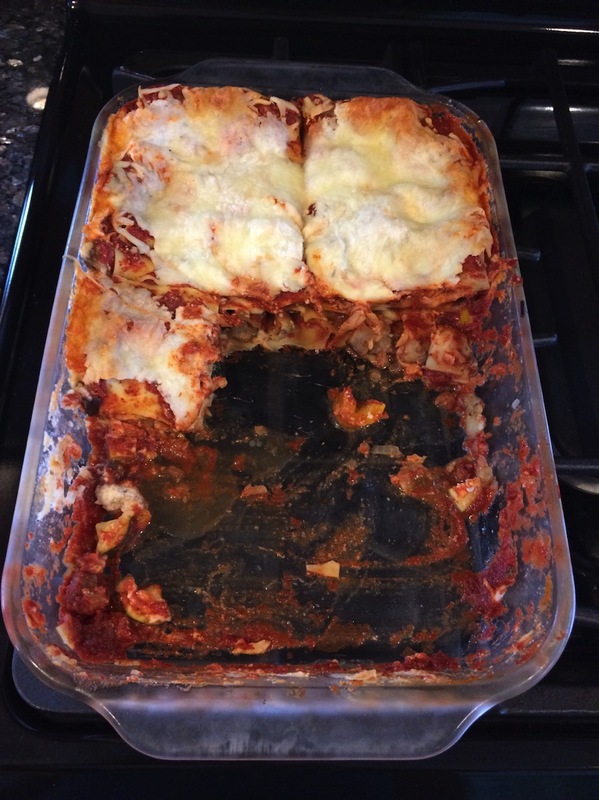 I really like the thin cheese sauce versus the mounds of shredded cheese used in a typical lasagna. I don’t think we did it the first time, but using Trader Joe’s Diced & Fire Roasted Organic Tomatoes with organic green chiles, rather than plain canned tomatoes, adds nicely to the dish. This is a great dish to make for vegetarian friends. I suspect they tire of eggplant parmesan or traditional spinach and mushroom lasagna. This dish is much more of a celebration of vegetables, and it’s less heavy on the cheese. I’ve found it pleases nearly everyone, and a great added bonus is that it’s able to delight vegetarians. It was really fun to make a meal together with Éric. If you have friends visiting who also like to cook, I’d definitely recommend setting aside an evening to cook something together. I think we opened the wine before we began cooking, which I’d also recommend. 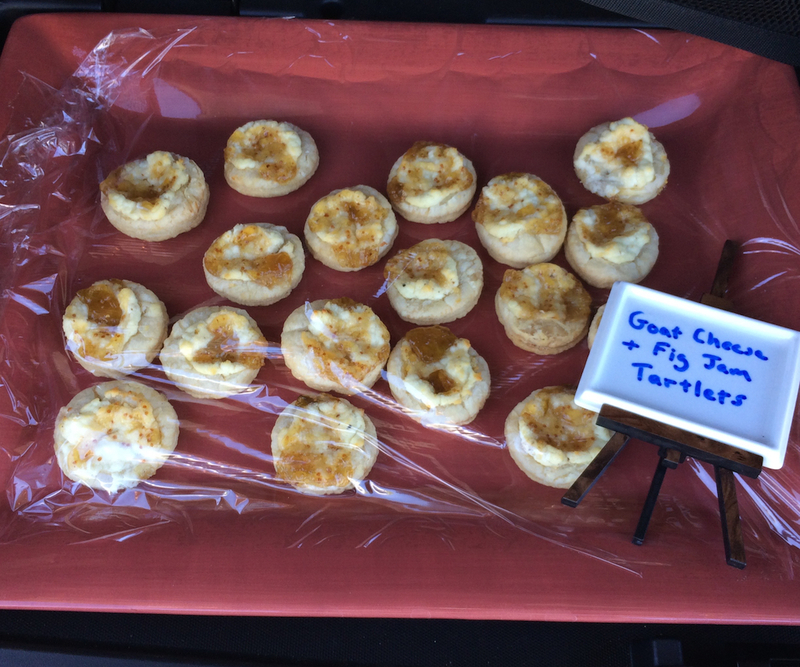 These are great for when it’s your turn to bring food to an organization, club, potluck, etc. They only take about 30 minutes to make from start to finish. They’re also a huge crowd-pleaser. The hardest part is remembering to move the puff pastry box from the freezer to the fridge the night before. Here’s how to make these delicious treats. You can definitely use other flavors of jam. Try to avoid ones which have high liquid content. I suspect you could also do a savory version of this, perhaps with a blue cheese and cooked bacon mixture. If I experiment with that in the future, I’ll try to come back and update this post. If you make these, let me know how they come out. I’m a convert to cooking meat sous-vide. I enjoy a perfectly-cooked, medium rare steak on occasion. I don’t eat red meat often, so when I do I really want it to be great. I don’t enjoy overcooked meat. I’ve also never liked the fact that there’s usually a certain gray, overcooked portion on the outside of a steak, while the inside is at perfect temperature. Cooking sous-vide is fairly straightfoward. You seal the meat in a plastic baggie with the air evacuated. You cook it at its perfect temperature for long enough to kill bacteria. You sear it at the end for exterior texture (and for show). There are some debates on the Intertubes about whether or not this technique is inferior to mechanical vacuum sealers. My experience says this technique works perfectly well, and it helps avoid an additional kitchen gadget. There are a lot more Sous-vide gadgets on the market now than there were three years ago, and the immersion circulators look like a pretty cool option. For my setup, I use a simple, dumb slow cooker which just has Off / High / Low for settings in concert with a temperature controller. My Dorkfood Sous-Vide Temperature Controller (DSV) includes a temperature probe, which goes into the water bath, and a pass-through into which I plug the slow cooker. When the temperature is too low, the controller turns the slow cooker on, and when it’s too high, it turns the slow cooker off. I cook my steaks at 137 degrees for one hour per inch of thickness. Note that you don’t start the clock on your cooking time until the water bath has achieved temperature with the steaks in. Keep in mind that it takes some time for the water bath to re-heat after you’ve dumped cold, vacuum-sealed steaks into it. When there’s about 20 minutes left, I’ll put the outdoor grill on high heat to prepare for the finishing touch. Cooking Sous-vide does not brown the exterior of the meat. It’s nice to have that texture and color for presentation, and you can do it by searing the steaks on a very hot grill or cast iron pan. You only need less than a minute on each side, and you’ll find that’s enough time to brown the exterior but not enough time to start overcooking the exterior of your steak. I’ve also used this technique to cook beautiful hamburgers and incredibly moist chicken breast. For chicken, you’ll use a different temperature and time. Enjoy! I first tasted Escalivada in Barcelona. It’s a smoky Catalonian vegetable dish. I charred my veggies on a gas grill rather than a wood fire, so my dish lacked some of the smoke flavor from the original cooking method. 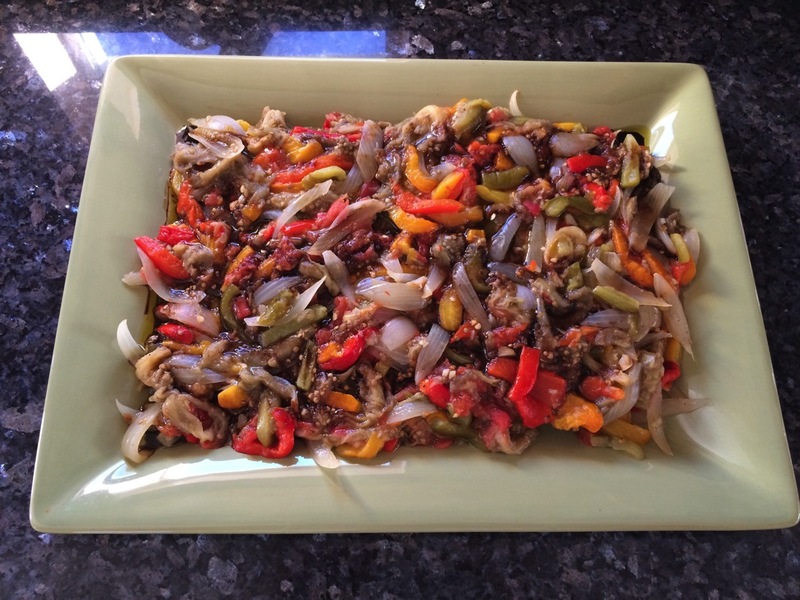 Escalivada is a great alternative to crudités if you want to have delicious vegetables on the table for a party. Serve alongside flatbread or crackers. The one downside to escalivada is the time it takes to prep the vegetables. It took quite a while to break these down into sizes appropriate for cooking. It’s also not a fast dish to cook, as it takes time for the flavors to build. The upsides are that the dish has a lot of color and a ton of flavor. I love eggplant parmesan. There are tons of great recipes out there, so I won’t trouble you with mine. 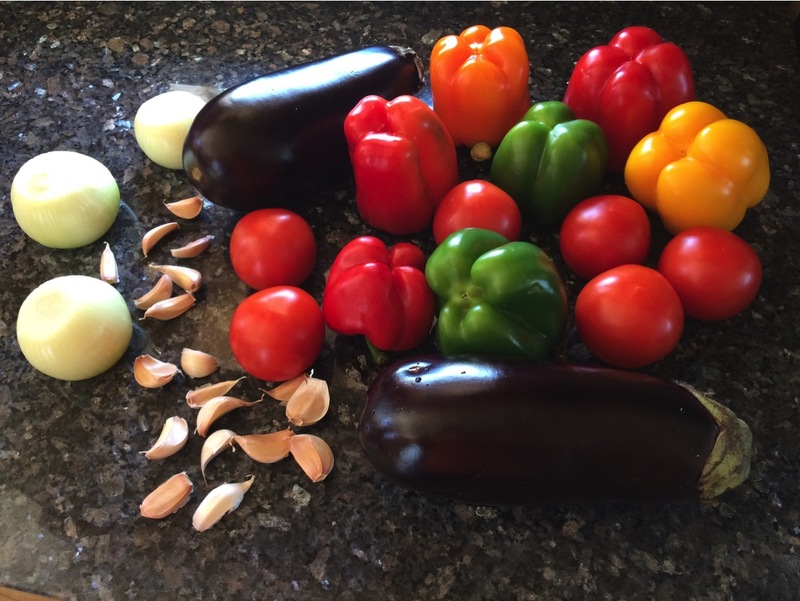 However, only one of them recommends that you sweat the eggplant before getting started, and to me that’s the one thing you must do when cooking eggplant. Large eggplants have a lot of liquid in them. Green, bilious, bitter liquid. If you leave it in your eggplant, you’re missing out on how great an eggplant can taste. 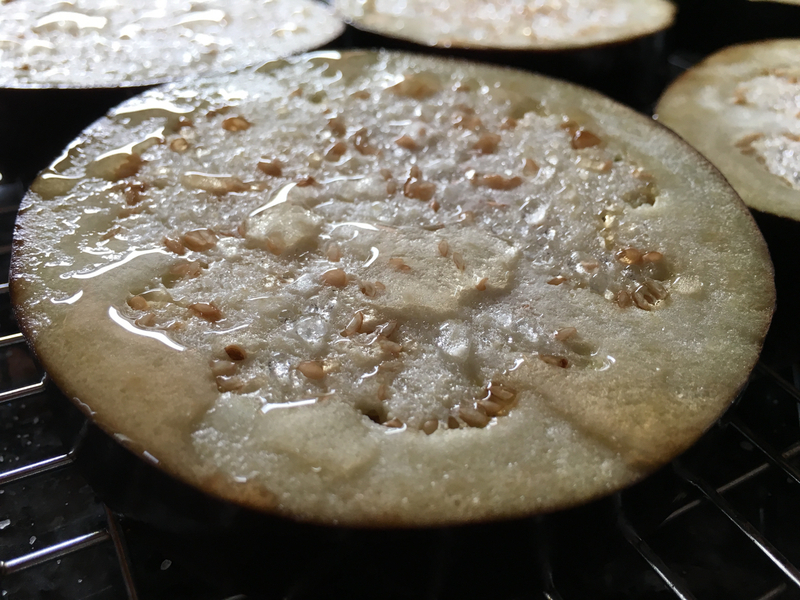 Once you’ve sweated your eggplant and actually see, and perhaps dare taste, the liquid, you’ll understand why you don’t want it in your dish. It’s really easy to sweat an eggplant. I put mine on a baking rack, salt one side liberally with sea salt, flip them over, salt the other side liberally with sea salt, and let them sit for at least 30 minutes. At that point, you’ll understand what I mean about the unappetizing liquid which appears. 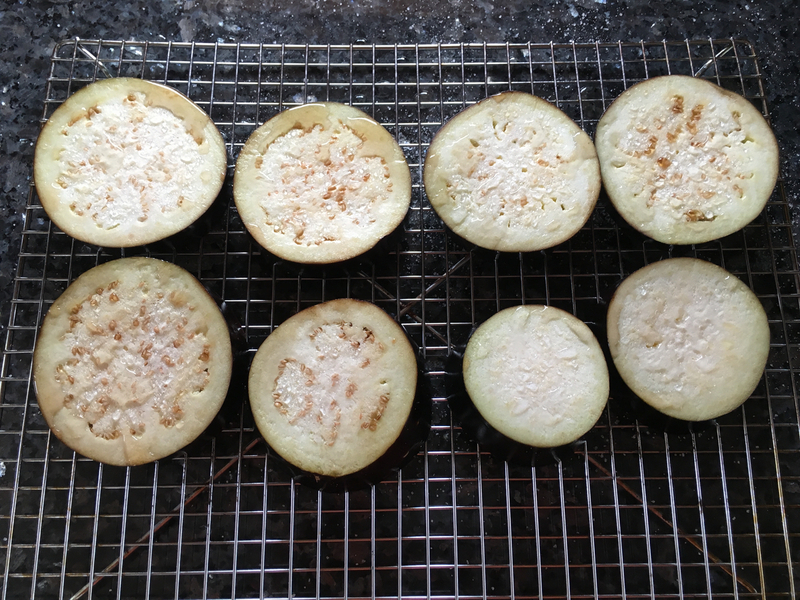 Once they’ve been sweated, I rinse the eggplant to remove the bitter liquid and the excess salt. Then I place them between paper towels and press them gently with a rolling pin to remove any excess water. At this point, they’re ready for use in your recipe, and they’re ready to impress you with how great a properly sweated eggplant can taste. This was the second of ten new dishes I made for my 2015 Resolution. This one was inspired by a stream of tweets from Daniel Jalkut of Red Sweater Software, maker of MarsEdit, which I used to write this blog post. If you follow Daniel and pay attention on Fridays, you’ll frequently see tweets such as this. One Friday, he even did a live video via Meerkat or Periscope of his pizza-making. 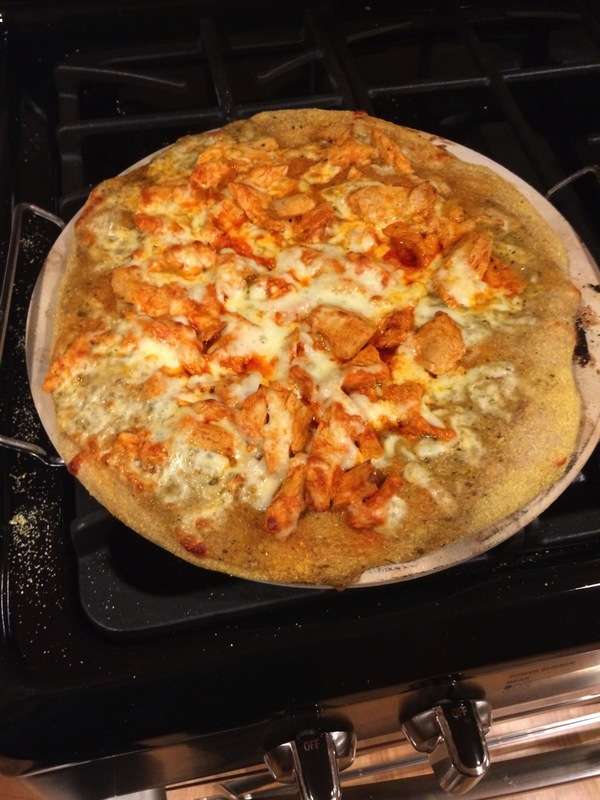 I think it’s his mission to dispel the myth that making pizza is difficult, and he does a fairly solid job of that. Enough to encourage me to try. I found making pizza to be messy more than anything else, as the pizza dough really likes to stick to surfaces, so you spread around a lot flour or corn meal to keep it from doing so. I also found that dough really doesn’t like to stay stretched out, so I needed to stretch it beyond where I thought it needed to end up and just trust that it would pull back. I’m a fan of Trader Joe’s, so that’s where I got my toppings. I like their chickenless strips because they’re an easy protein to work with, and they take on whatever flavor you sautée them in. I used Frank’s Red Hot this time. Philip suggested that I brush the dough with olive oil before saucing it, and that turned out to be a good idea. I love TJ’s red and green Thai curries, so I used the green curry for the sauce. I put some cheese on top, and I was ready to go. The final challenge to pizza making is getting the pizza from the peel on which you’ve prepared it onto the hot stone. Pizza doesn’t like to slide. The dough likes to pull back. The ingredients like to get in the way. This part of pizza-making will take me years to master, but they’ll be fun and yummy years I’m sure. For now, the marked “left shift” of ingredients in the picture above is testament to my novice status as a pizza maker. 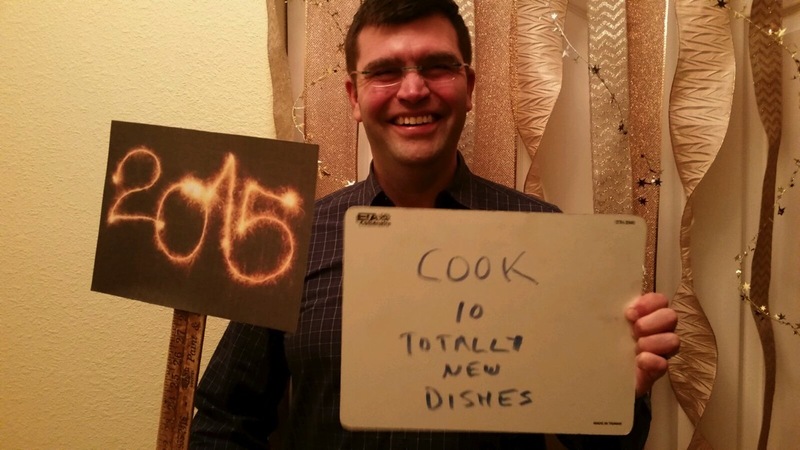 This was the first of ten new dishes I made for my 2015 Resolution. I’ve made chilaquiles in homemade green salsa before, and I like them very much, so I wanted to try a different sauce. I decided on a red salsa, made with guajillo (wah-HEE-yo) peppers. 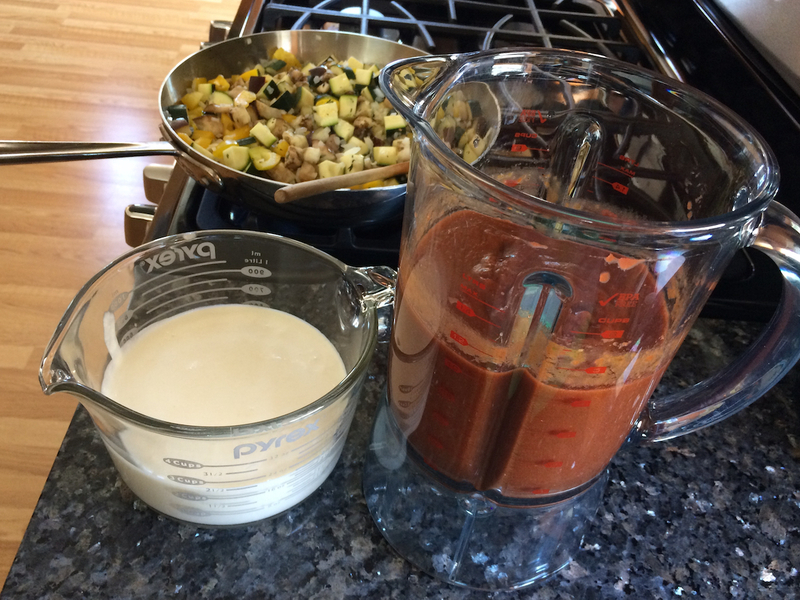 I started with this recipe for the guajillo sauce. 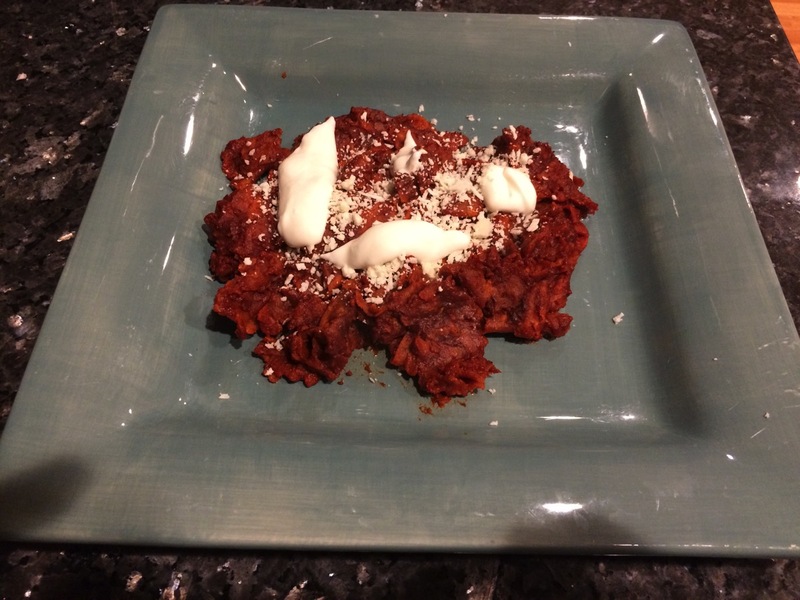 If you’re going to use the sauce for chilaquiles, you can simplify the recipe by putting all of the broth into the blender then running the result through the strainer. Skip the bit with the medium-sized pot to thicken. Add epazote if you can. To complete the chilaquiles, put 2 tablespoons of vegetable oil into a cast iron skillet, heat the oil at medium-high, and pour in the sauce. Once the sauce is bubbling, reduce the heat to medium, and add tons of tortilla chips. Pretty much fill the pan. Stir until the chips are coated with sauce. Eventually, the chips will saturate and sop up all of the remaining sauce. When they’re nearly done, reduce the heat to low and prepare to serve. I recommend topping with grated cotija cheese (queso cotija) and Mexican sour cream (crema Mexicana). Yum! We agreed that I would send her pictures of each new dish I made, so I have a record of this particular challenge. Here’s a list of what I made. Check back, and I’ll link them to posts where I elaborate on them with photos and recipes. This was a good party game, and it turned out to be a very fun and tasty resolution.